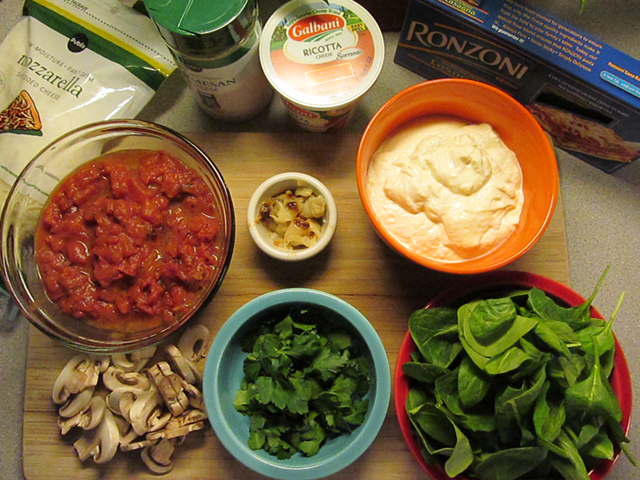 It seems a bit shameless to call this a “recipe,” because it’s mostly assembling, putting together ingredients with bits and pieces of love and memory. 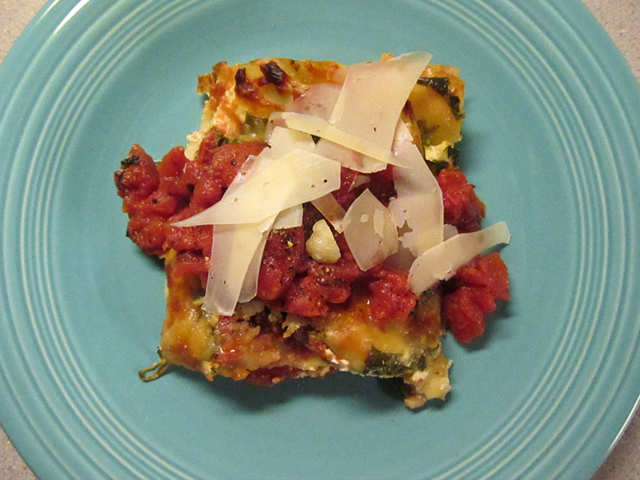 But this lasagna recipe includes a new twist for me, something I’ll call “Julie Sauce.” Read on. Normally, I make Mama Carbone’s marinara for pretty much any Italian dish that calls for a red sauce; the recipe is here. This recipe uses a tomato sauce (gravy, if you prefer) that is so easy you’ll swear it won’t be any good – until you make it. My good friend and a total cooking genius, Julie Greenberg, relayed this sauce recipe and I watched her a bit skeptically while she made it during Nashville’s recent record ice storm. Forever, it will mean warmth and comfort to me, as the products of her kitchen always do. Put the ingredients in a sauce pan; the entire half of onion goes in intact. Bring to bubbling, then turn down and simmer for 30 minutes. Remove onion. It’s done. That’s it. You can use whole or crushed tomatoes and, if you really like the onion, you can take it out, puree it, and add it back to the sauce. Try it both ways. Beat the egg and ricotta well; set aside. 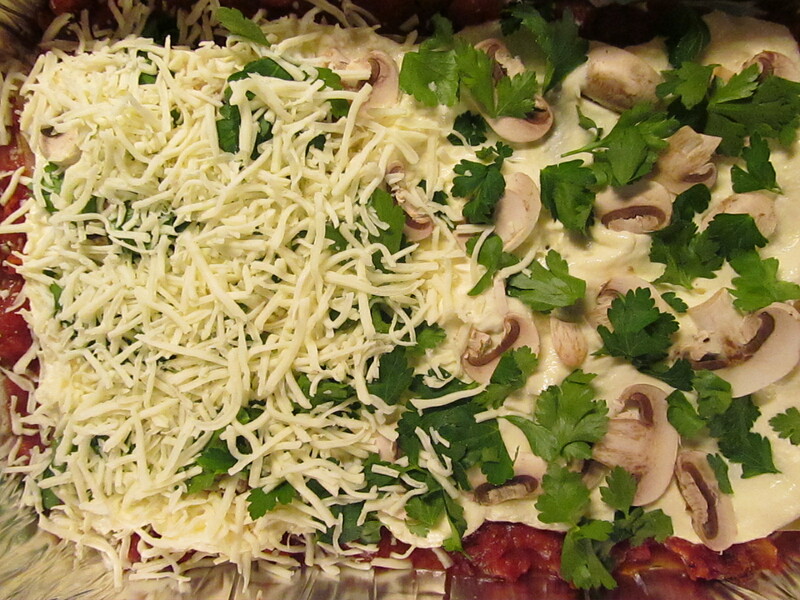 In a deep baking pan, start with a layer of sauce, add a layer of noodles, then a layer of the ricotta mixture. 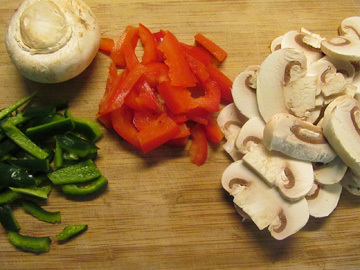 After that, you can add mushrooms or spinach, and parsley in any order you want. 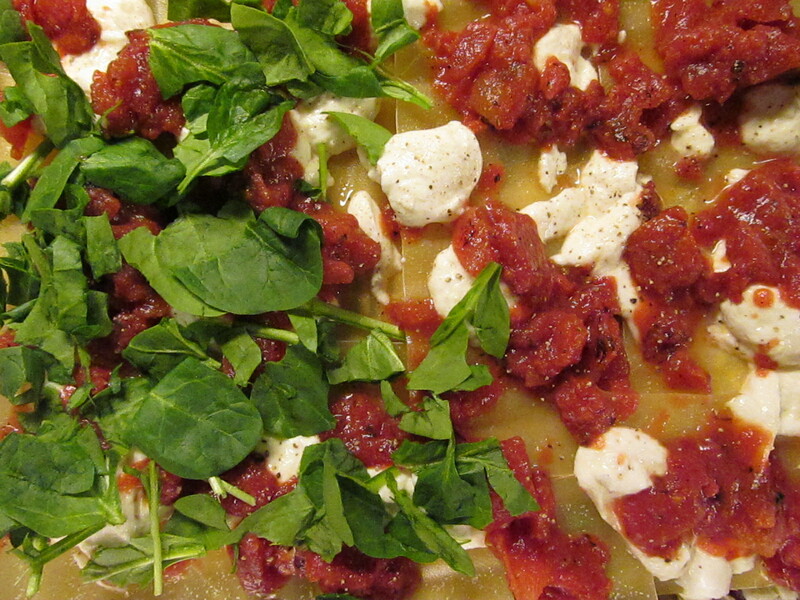 Just be sure that each layer contains sauce, lasagna noodles, and ricotta, with mozzarella and parmesan. Here are some progressive pictures of the assembly, showing ingredients added (left to right in each shot) to layers. You do it your way. That’s the roasted garlic you see in the image above. 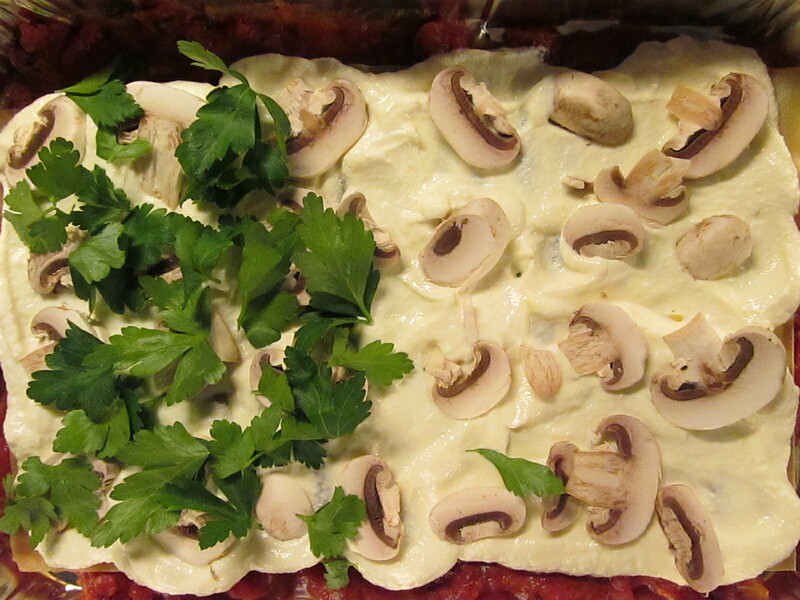 There you have it, the finished lasagna! 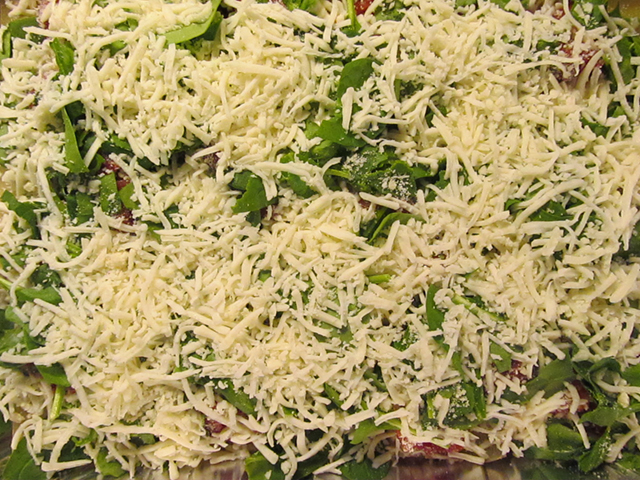 Bake at 375 degrees for 45 minutes covered with foil, then remove foil and bake a few more minutes until the top layer of mozzarella is bubbly and beginning to brown just a little. Serve with more Julie Sauce, garnished with shaved parmesan. 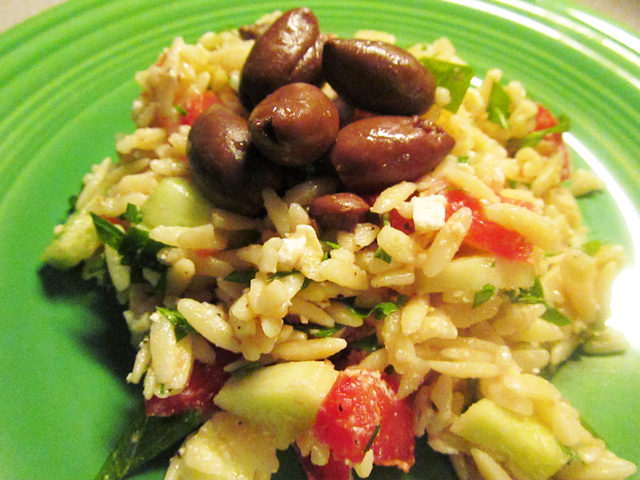 This is a twist on all those great orzo salad recipes out there. Yours may be different; put in the things you like most from summer’s bounty. 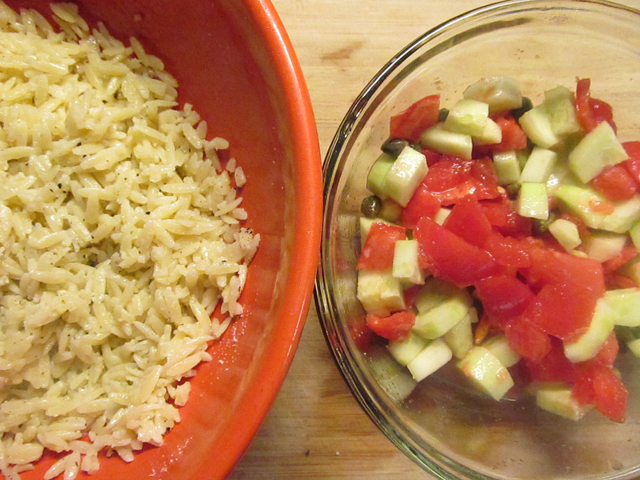 Cook the orzo according to package directions, drain, put in large bowl; drizzle some olive oil (not too much, just enough to coat the pasta) and put in a generous amount of grated parmesan. Let cool while you do the rest. Chop the tomatoes, cucumbers and parsley and put them in a bowl with the lemon juice (sorry, you know I don’t measure anything) and a sprinkling of garlic powder to taste. 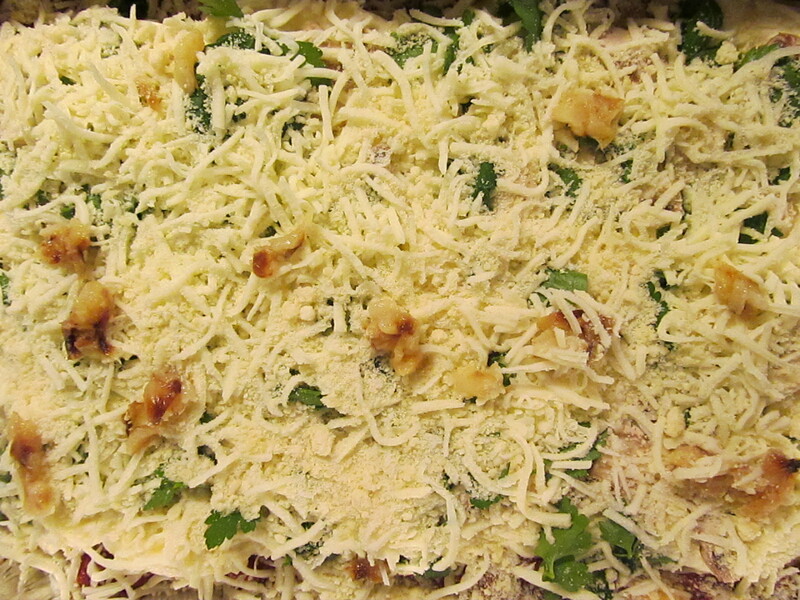 When the pasta/parmesan mixture is room temperature, fold the veggie mixture into it. Salt and black pepper to taste. Chill. 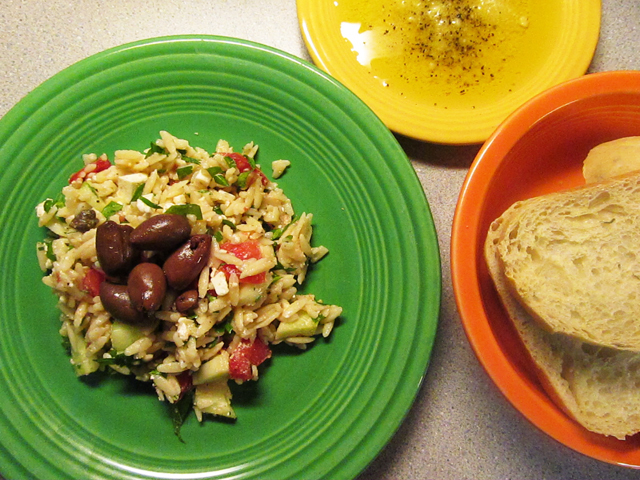 Before serving, add crumbled feta and garnish with pitted greek olives. 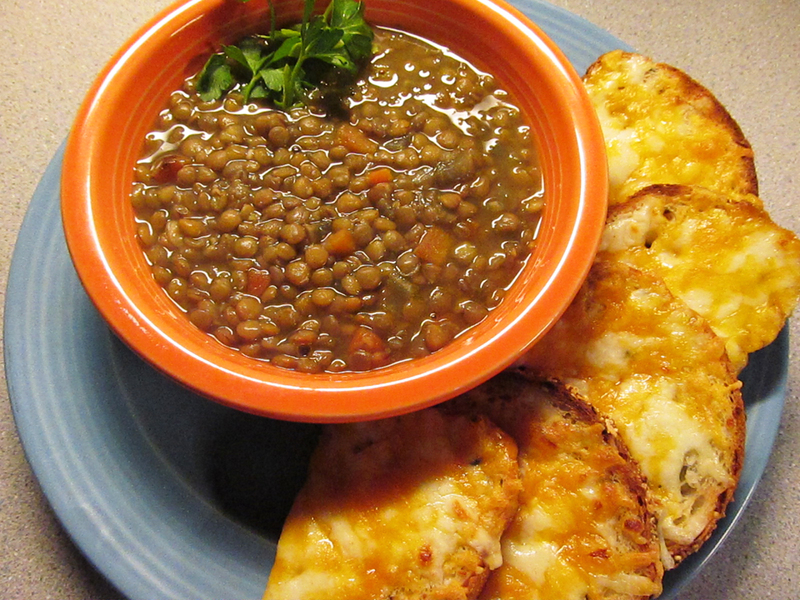 Serve with a good, stout bread and olive oil with parmesan and pepper. To get to our favorite beach in the Florida Panhandle, my husband and I drive the entire length of the great state of Alabama. In Clanton, just a wide spot in the road, there’s an eatery called the It Don’t Matter Restaurant. It looks like your basic meat-and-three; we’ve never eaten there because, as vegetarians, the Deep South is a mine field for us. But the place is always packed. Where else would you eat in Clanton, Alabama, you ask? Well, it don’t matter because there isn’t anyplace else. As I’ve said many times on this blog, I don’t like to measure. I am the spawn of a long line of a-pinch-and-a-handful cooks, so that’s how I roll. 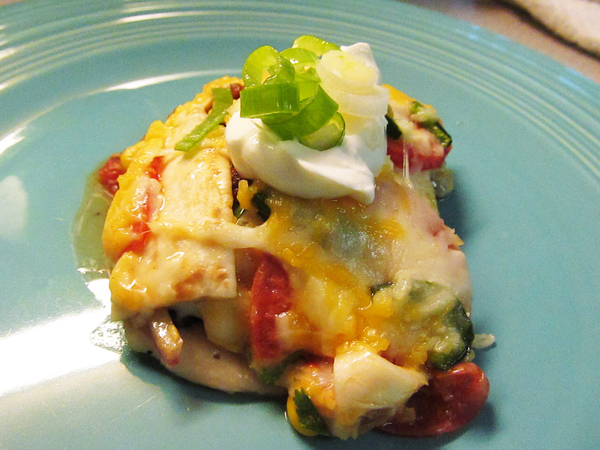 One recipe that’s quickly becoming a favorite is what I call Mexican Lasagna. It’s different every time I make it, depending on what’s in the crisper. (If they were honest, they’d call it the Good Intentions Bin.) Click here for more about that. 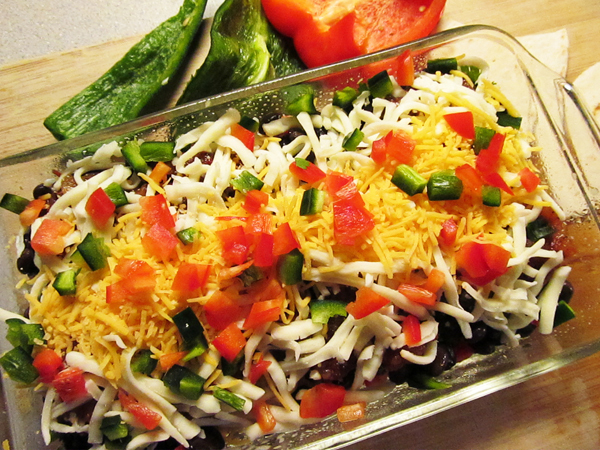 Next time, I’m going to try adding the Boca Soy Crumbles, which I use in my vegan chili recipe, because they are a very credible and tasty protein source. And don’t bother measuring, because…you guessed it. It don’t matter. P.S. 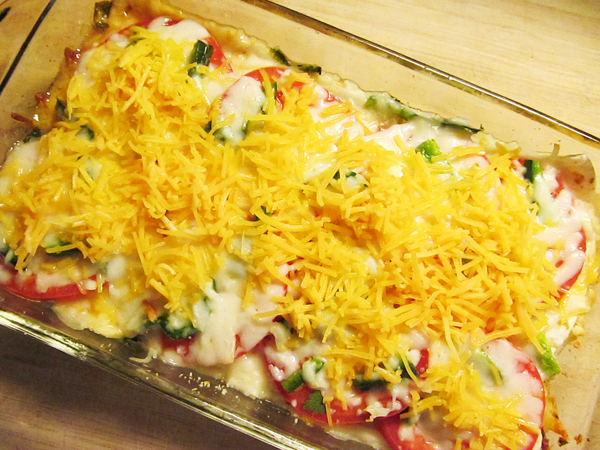 The picture that goes with this post is from the last time I made it, before it went into the oven. Yours will look different. 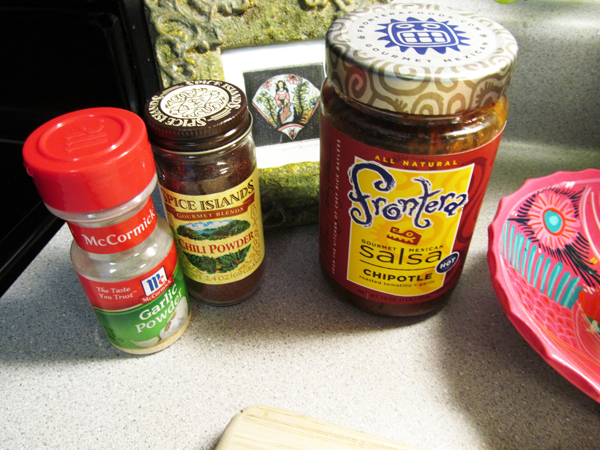 Gather flour tortillas, grated mozzarella and cheddar cheeses, Frontera chipotle salsa, garlic powder, and chile powder. 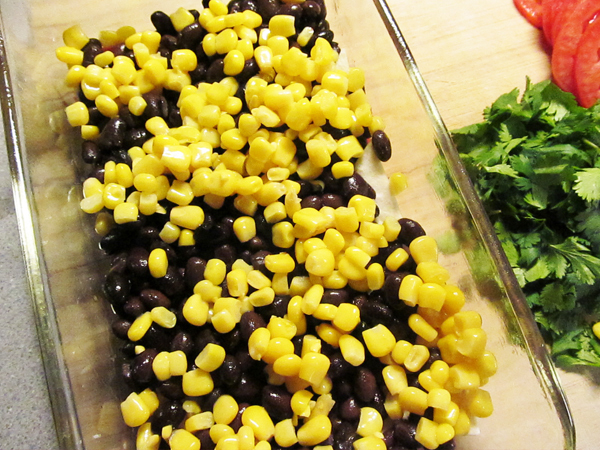 Drain one can each of black beans, niblet corn, and fire-roasted tomato bits. 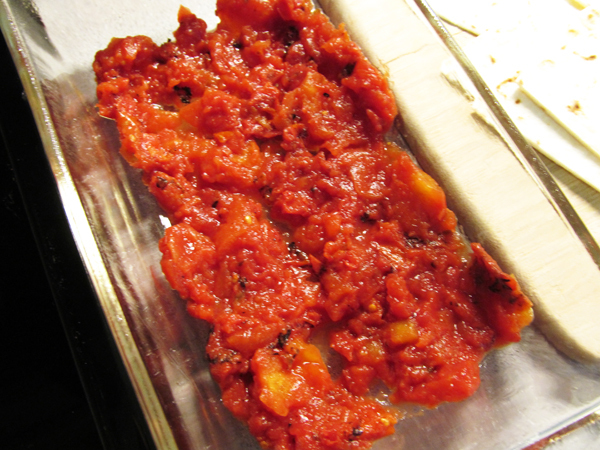 Squash the tomato bits in a bowl with a potato masher, and strain again. Chop your veggies – red onion, scallion tops and ends, poblano peppers, roma tomatos, whatever you have – and remove the stems from a handful of fresh cilantro. 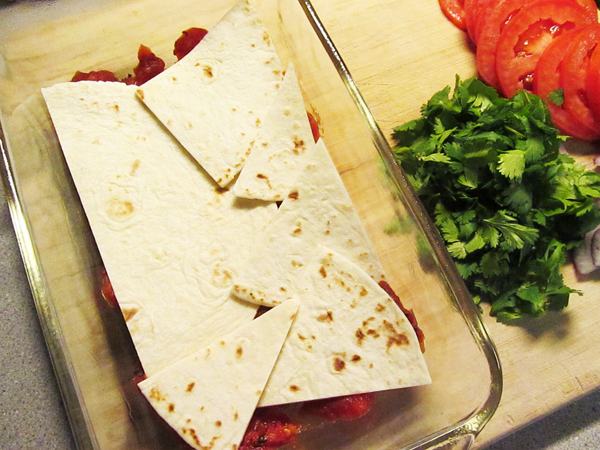 Then, add mozzarella cheese and continue to layer veggies, cilantro, tomatoes, chipotle salsa (one layer of dollops of this salsa is probably enough, as it is very hot), one more layer of tortillas, and a final layer of cheese. Bake covered with tin foil for 50 minutes at 350, remove tin foil, and bake for 15 more minutes. Before serving, let the lasagna rest for 20 minutes. Slice into sections, remove carefully with a spatula (it’s going to be a bit gooshy). 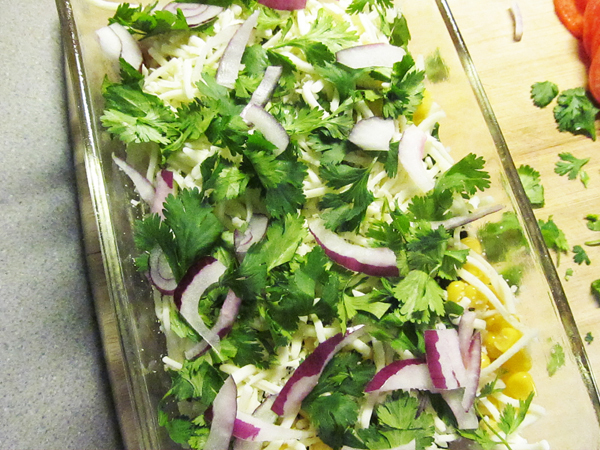 Top with a dollop of sour cream and garnish with some of the chopped scallions. Bonus: Since I don’t measure, I ended up with some miscellaneous chopped ingredients after assembling this mexican lasagna. So, I threw them in a bowl, added just a little oil, red wine vinegar, lime juice and garlic powder and BAM! 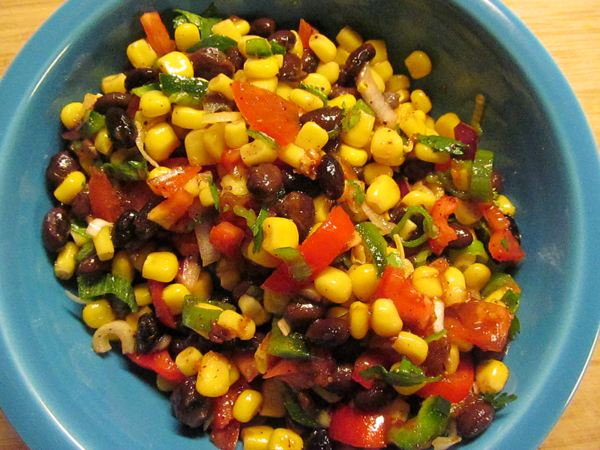 (sorry, Emeril) I have a corn-and-bean salad. Toss in some chopped fresh avocado before serving with corn chips. Every so often, I come up with a vegan recipe by accident. Normally, I’ll eat a piece of cheese as big as my head. Eggs provide some extra protein, and I crave fish. Thus…ovo-lacto-pesco. 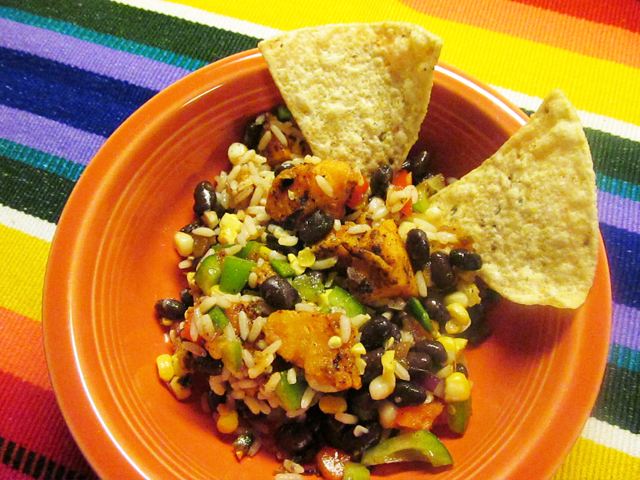 For the following dish, I just happened to have the ingredients on hand, cooked them up, and then decided it would be just as good cold as hot. It was. Here’s what you need and, as usual, the proportions are up to you according to your taste and to what you have calling to you from the crisper. Cook the noodles to al dente, drain, set aside. Chop the veggies. 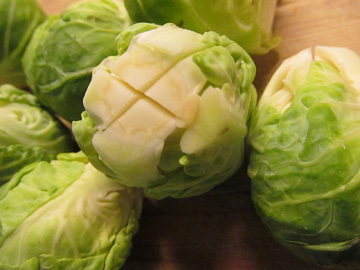 Cut off the hard ends of the brussels sprouts and cut a deep “X” in the end of each one. Parboil for 7 minutes, drain, dunk in cold water, and drain again after they have cooled. Cut each sprout in half lengthwise and set aside. 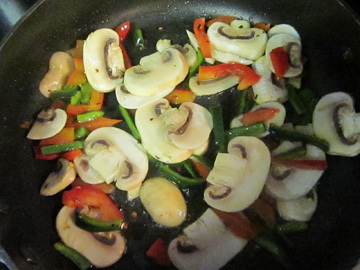 Heat a skillet to medium-high and add a little vegetable oil. 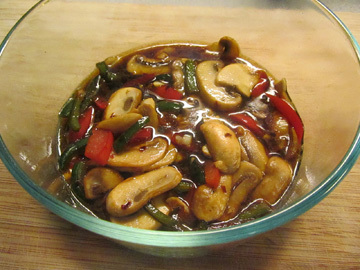 Quickly saute the veggies with hot red paper flakes, adding a little lime juice and a lot of tamari or soy sauce, as well as about a half a beer. (Don’t waste the other half; drink it.) Throw in the minced garlic and the sugar, turn the heat down to medium, and let the liquid thicken just a little. Pour off the veggie mixture into a bowl. While the skillet is still hot and has a little of the moisture left in it, turn the heat back up to medium high, throw in the brussels sprout halves, and quickly char them a bit. 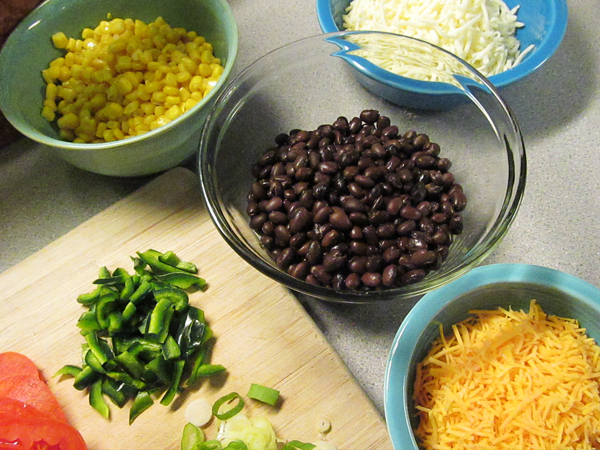 Add them to the bowl with the veggies. 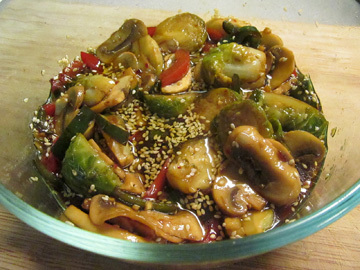 Add some sesame seeds if you want. 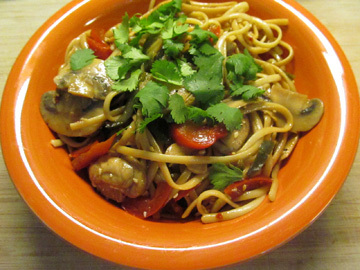 After the veggie mixture has cooled, pour it over the noodles, toss, and put in the fridge. 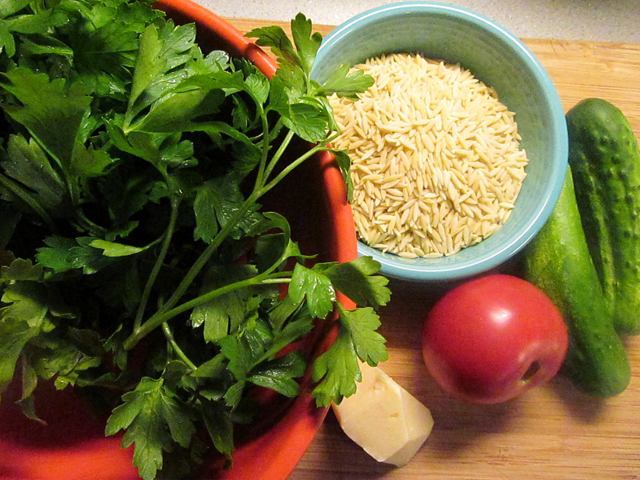 Before serving, add lots of fresh cilantro (stems removed).